1. a loop, ring, or spoon-shaped instrument, attached to a handle and having sharp or blunt edges; used to scrape tissue from a surface. 2. to remove growths or other material from the wall of a cavity or other surface, using a curette. Instrument in the form of a loop, ring, or scoop with sharpened edges, attached to a rod-shaped handle, used for curettage. 1. a spoon-shaped instrument for cleansing a diseased surface. 2. to use a curet. 1 n, a surgical instrument shaped like a spoon or scoop for scraping and removing material or tissue from an organ, cavity, or surface. A curet may be blunt or sharp and is designed in a shape and size appropriate to its use. Also called curette. 2 v, to remove tissue or debris with such a device. Kinds of curets include Hartmann's curet. 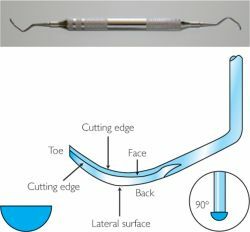 A surgical instrument with a circular cutting loop at one end. The curet is pulled over the skin lesion in repeated strokes to remove one portion of the lesion at a time. n a periodontal or hand instrument having a sharp, spoon-shaped working blade; used for debridement. It is available in many sizes and shapes; used for root planing and gingival curettage, both surgically and nonsurgically. n any of a number of curets designed for use on specific tooth surfaces. It may feature an elongated shank or shortened blade. n a small dental instrument employed in the surgical removal of unwanted materials, useful in getting at narrow or closed-off areas of the teeth and oral cavity. n an instrument used for removal of subgingival deposits and root debridement. n an instrument that has combined features of the Gracey curet and universal curet. n an instrument made with a rigid shank that is stronger and aids in removal of tenacious deposits. n an instrument designed to permit ac-cess to all surfaces of the tooth without the need to change instruments during deposit removal or root planing. n an instrument used on subgingival sufaces. It has a blade with an unbroken cutting edge that curves around the toe and a flat face that is set at a 90° angle to the lower shank. 2. to use a curette. there are a number of types, e.g. brun bone curette, nail-hole curette. For Curet, this set of incommensurable variables defines the long-run tendency of growth and is also important in the determination of the annual fluctuations in the GDP Therefore, to complement this explanation of the development process for the second half of the twentieth century, one must also consider a political and institutional analysis, which is the principal objective of the book. For more information on Tite Curet Alonso, please visit a website created by Mind Oven, www. Popular Pays Homage to Tite Curet Alonso in 19th Annual Holiday Music Special - Sono, SonoOTite Curet! Curet and Torres conclude with an excellent synthesis that places the archaeological finding within the broader context of Caribbean cultural development. Two years in the making, this new recording showcases a balanced repertoire of original scores and hand-picked classics such as the Tite Curet Alonso composition Prucutu Cumbamba (a fire-breathing bomba arranged by Papo Vazquez and featuring the talents of master percussionist Anthony Carrillo); the Arsenio Rodriguez composition Yo Soy Chambelon, as well as the Justi Barrete selection Okere, keeping this Afro Caribbean dance party cooking with intensity from beginning to end. Using a 4 x 5 counter balanced research design each participant used a Gracey 11/12 curet to scale up to one cc of artificial calculus from the first permanent molar typodont teeth (#3, 14, 19, 30). 8e6 experienced record growth in 2007, driving the company to implement changes to our sales structure and partner program to increase focus on channel-driven sales," said Luis Curet, vice president of sales at 8e6 Technologies. En su vigesimosexta edicion, el concierto fue dedicado este ano a Rafael Cortijo, al arreglista y tresero Louis Barcia, al radiodifusor Polito Vega y al compositor Tite Curet Alonso. This study determined differences between the Arkansas sharpening stone and the Idahone ceramic sharpening stone in producing a sharp cutting edge on dental curets, as well as differences between the degree of root smoothness achieved by the sharpened curet cutting edges on extracted human teeth. In mid-2007, security industry veteran Luis Curet came on board as vice president of sales to lead and expand the sales team. Insert a Gracey 1/2 curet subgingivally at zero degrees on the distal surface (proximal) of tooth #8. Es el dia de recibir regalos y fue en esa fecha del ano en curso cuando los salseros de Puerto Rico recibieron un gran obsequio: Escuchar nuevamente la musica del compositor Catalino "Tite" Curet Alonso en la radio local. In addition, the company added Luis Curet, formerly senior vice president at ClearPath Networks, to lead 8e6's sales team.